Just thought I would share a video of what the hall at work looked like on Wednesday. Rack check day for The Music Man. Eight eight foot rolling racks. Its a lot of work when you finally see a show on the racks. My contribution was all of Harold Hill, two trousers three waistcoats, four jackets including a trick reversible jacket plus revamping an existing marching band jacket and trousers. All of the quartet town look, four jackets, four waistcoats, four trousers, revamping four sets of salesmen jackets and waistcoats and making and installing 15 period shirt collars onto the shirts. This is just one of the four shows I am currently working on. I don't have much spare time these days. Just reading your portion was exhausting! Truly impressive work. You obviously love what you do. You are incredible, thank you for sharing. Getting to this point and then seeing it all onstage always feels like such a relief! Next deadline is April 23. I have six three piece suits to get done for that one, in addition to a numbet of characters wearing stock / broken down clothing. I am cutting the last one in fabric on Monday, three of the others are almost ready for a first fitting in fabric. It will be a bit hectic for a while. That is a massive amount of work. Enough to keep a Chinese factory going for a few months. I am very fortunate to have a fabulous team of tailors too. Most have worked with me for 15+ years so we have a strong rapport. Due to a lack of increase in budgets over the past few years each cutter only has four tailors or seamstresses. We are currently at five because they found some training money so we have a trainee for eight weeks and she is so good! We must think of the future, despite management only seeing the here and now. If I think about working with all that marvellous fabric you work with, I envy you. who did cut today a fabric with the print not working with the grainline for herself and it was not cheap!! What happens to all the clothes that are made for awkward figures, when the same person doesn't appear in a production again? Or is it like a stock players company? All the costumes are catalogued and stored in a very large warehouse once a production is finished. 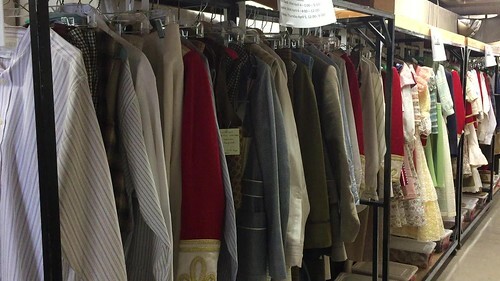 Designers do pull older costumes for re use, so they may get altered, and many costumes become available for rental from other theatre or film productions. There are some pieces that likely sit unused for many years, because of odd design/colour/shape/fit so every decade or so, they cull out certain pieces and have a sale. The actors who have very specific fit issues or size/height often have to be built for. I dont know why the casting people are surprised when we point out that casting a 6’5” tall size 48 chest to understudy a 5’6” size 38 costs money in additional costuming. I don't know why the casting people are surprised when we point out that casting a 6’5” tall size 48 chest to understudy a 5’6” size 38 costs money in additional costuming. I'd like to see the expressions on your faces when you receive this information. Maybe the casting people think the sleeves will just ride up with wear?